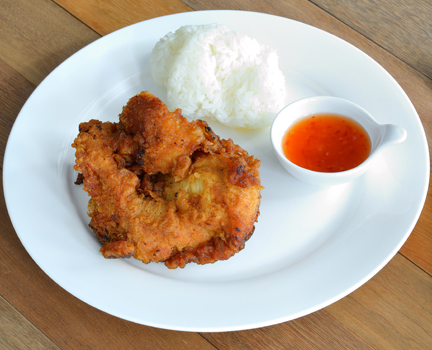 The chicken in our dish has been marinated overnight in buttermilk and oven fried with a flavorful, crispy coating. Serve with our sticky orange sauce poured over the top and a side of steamed rice. Oranges are in season now; so give your sauce some extra flavor and use fresh squeezed orange juice! Place the chicken breasts in a plastic zip-top bag. Pour the buttermilk over the chicken. (Be sure to double bag or place the bag in a bowl to avoid a mess should the bag leak.) Refrigerate overnight. Preheat the oven to 400 degrees. Remove the chicken from the buttermilk; pat off the excess milk with paper towels. Discard the remaining buttermilk. Lightly salt and pepper both sides of the chicken. Whisk the egg with 1 tbs of water in a flat dish. Whisk together in a bowl the corn flake crumbs, orange peel, garlic, ginger and cinnamon. Mix well and pour the crumb mixture into another flat dish. Place a metal cooling rack inside a large sheet pan lined with foil. Dip the chicken breasts in the egg then in the crumb mixture pressing on the crumbs on both sides to lightly coat. Place the coated chicken on the rack skin side up. So the crumbs will set, place the sheet pan in the fridge for 30 minutes. Remove from the refrigerator and very lightly brush the top of the chicken breast with olive oil. Transfer the sheet pan to the oven and bake about 45-50 minutes or until the chicken’s internal temperature reaches 165 degrees. While the chicken is baking, make the orange sauce below. Place the orange juice in a saucepan. Heat to simmering and cook until reduced to about 1/2 cup of juice, about 20-30 minutes. Stir in the marmalade, salt, and orange liqueur. Simmer for another 15 minutes until thick and the sauce coats the back of a spoon. Serve warm with the chicken.